The H-Series is a significant departure in style and functionality from a typical desktop 3D-printer. How did that come to be? The initial plan for the H-Series project was to build a multi-material printing system with a focus on elastomers. Specifically, we began by targeting footwear and sporting goods. Both product types utilize elastomers for their combination of strength and flexibility, and are ideal applications for 3D printing because of the high-price point of the finished product and the potential for customization. In both casual and performance footwear, there is a clear willingness to pay a premium for personalized fit and performance. Also, in our projects, we’ve found elastomers to be much better suited than rigid plastics for creating functional parts with extrusion printing. The high layer adhesion of urethanes gives a much more isotropic and durable finished part. Given the ability of the Flexion Extruder to print elastomers quickly and accurately, this was a natural starting point for the machine design. The Flexion Extruder is a direct drive setup with a short compression path between the drive roller and the hotend. This offers a number of benefits, but means that the toolhead has a relatively large mass, so a lightweight printer form like a delta or prusa would not be suitable as we increased the number of toolheads. So we started looking at the machine less as a desktop printer and more as a piece of heavier laboratory or shop equipment. A higher tolerable mass of the machine overall made higher stiffness of the motion control system feasible. Borrowing from the machining industry where the toolhead is not a low mass component, it made more sense to only move the toolhead in Z and to move the workpiece in X and Y. This is a common configuration for vertical machining centers where rigid, accurate, high-speed motion is necessary. Throwing out the low-mass requirement for the toolhead also allowed us to consider a broader range of options for toolchanging. The main requirement for a tool changing system is that it be accurate and repeatable so that tool offsets do not need to be updated from one operation to the next. Tool changers that transfer individual tool heads from a storage device to the motion control system generally have complex mechanisms to secure and release the tool heads – and the accuracy of those mechanisms needs to be much greater than the accuracy requirement of the motion control system. Also, the stiffness of the securing mechanism needs to be appropriate to the expected forces on the toolhead. This is why in the machining industry, high-precision tapered interference fits are used to secure tools. In our case, this level of complexity wasn’t suitable for the machine we were designing. Instead, a turret-style tool changer was more appropriate. With the tool heads securely fixed to a turret setup on a horizontal axis, the working tool head can be brought into position simultaneous to the removal of the previous tool. And because it’s not relying on mechanical mates, this motion can be extremely repeatable – limited only by the accuracy of the precision, preloaded turret bearings. In order to test the turret concept with extrusion printing, we built a proof of concept machine – H1. The H1 machine also allowed the development, testing, and iteration of a number of other systems necessary for the H-Series. Building on what we learned from this proof of concept, we added more features and took a first cut at the aesthetic design to create H2. 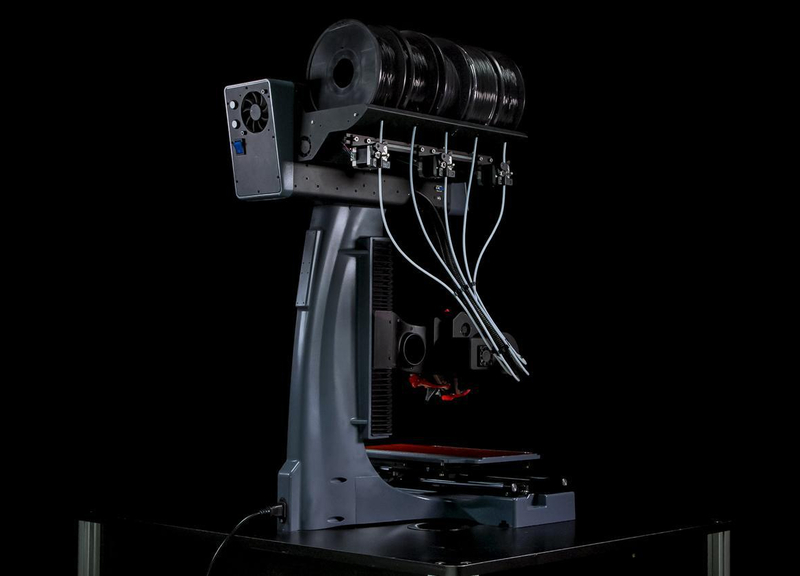 The new machine configuration included conveniences such as an eye-level tablet interface, as well as features that remove important barriers to printing: quick-release heated bed, push/pull filament loading system, filament-drying cabinet, and an active nozzle cleaner. After every iteration, the machine was made more rigid in every way. By the third iteration the overall rigidity of the H-Series motion control system made subtractive toolheads an obvious next step. By developing an air-cooled spindle with a form factor similar to a Flexion Extruder, we were able to use the same tool changing system for subtractive tool heads as we had developed for additive. Rather than swapping cutters in and out of the same spindle, we can call up different spindles with preloaded cutters. This is closer to a live-tooling setup on a lathe than to a typical milling machine or router. Many new build strategies are opened up with this setup. This additional capability does come with some additional demands on the machine. The major difference between most additive and subtractive processes is the typical tool load. Machine tool design requires rigidity. Higher speeds, tighter tolerances, harder materials, finer surface finishes all require lower deflections of the tool and workpiece under load. So in order to make gains in the subtractive capabilities of the machine, we developed add-on and replacement components to improve rigidity. Subtractive processes are also invariably noisy and messy. Both of these problems are addressed with a good build enclosure system. The design now incorporates an easily removable vacuum-formed enclosure with appropriate penetrations for exhaust or circulation airflow. This is also useful for containment and exhaust of fumes from additive processes. Through the many design and prototype iterations, we’ve arrived at a product that is quite a bit different from our original concept of a footwear printer. We look at the machine now as a multi-functional manufacturing platform. The design concept is modular so that the machine can be configured and optimized for the particular needs of the user. It will be available in a model that is configured for the quick lightweight movements of additive-only operation. It will also be available in a more rigid version for additive and subtractive (Hybrid) operation. The modular components and systems will also be available in kit form so that an additive model machine can be upgraded to full hybrid capability. We also see this product as a platform for us to continue to develop and release new deposition systems and other drop-in technology. So far, the H-Series has been an incredibly useful tool in our own prototyping, and we’re sure that the capabilities the machine offers will quickly become indispensable in labs and shops around the world.